Hey guys. Currently in Singapore feeling very tired and red-eyed. I had about 3 hours sleep before the flight (which is enough to JUST last me until landing) and I fell asleep again in the hotel for a grand total of... 2 hours. Everytime I get a Singapore flight, I always promise myself to go to either the Jurong Bird Park, or the Botanical Gardens. But somehow I always manage to wind up at Orchard Rd, spending way too much money, or at Zouk getting sloshed because it's the only decent place to drink on a SIN-CMB trip. But now I'm wrecked, and I know for sure that in a few days when I land it'll be the same. So maybe it's just Xmas shopping on the cards. The Xmas tree that's shining a bright green light into my hotel room. Will get a better photo of it tomorrow morning when I go out for breakfast. Meanwhile, Ash's gone a little Xmas crazy. Since I got back she's been playing Xmas carols by Mariah Carey, Celine Dion, and Leanna Rimes. She's even got Alvin and the Chipmunks singing carols. There's a wreath made out of Lifco plastic bags in our living room. There's an angel on top of the TV. And she's bought a Christmas tree, and stockings for all of us to chuck presents in. It's not even December yet. I'm scared. Carols and joy and goodwill just don't come naturally to me. Downing a Chip Roll from Geroge's Kebabs, smothered with garlic sauce with a light sprinkle of chicken salt, all washed down with post-mix Coke-Cola. Dinner at Pancho's - Tula's the best! Buy lunch from Supa Valu, grab a 4-pack of Jesters' Spud Delux, and eat it finding out that the outside is hot enough to scorch the tongue, but the inside still has icicles in it. Realise that I'm not even 50% of the way through the floors when Dad & Peter get home. Hey guys, just wastig time at the airport at the moment. I still have another 2 hours to kill. Free wireless here is starting to annoy me as it keeps transferring back to the airport website which is a pain, but if it's free then you shouldn't complain too much. About 50% of the passengers that walk past has luggage that is waaay too big. Sometimes I wish that they banned wheels on hand luggage so that when pax realise how heavy it is then they won't bring it on board, instead opting for a backpack/laptop bag or slim briefcase. Those buggies in the airport - a heap have gone past, but I've only seen one person who actualy needed it (elderly pax). Aside from stopping you moving around your legs before hopping onto a plane in economy with minimal legroom, it's bloody annoying having the buggy ram into your shins. Seen one woman who enjoyed the Dubai sun a little too much. Turned out red raw and wore coral lipstick to boot! Who on earth buys washing powder at duty free!?! Why do people who are in transit sleep on the floor and block 4 seats in the process? There's heaps of ideal floor sleeping locations, and a hotel for goodness sakes. I don't know. Maybe because I deal with these sort of people every week that even when I'm not working they seem to grate on me. Hey there guys. 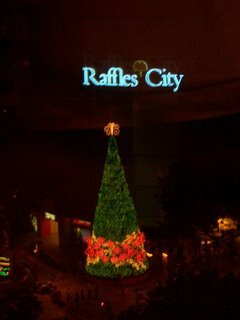 Just came back from Manila this morning. Loved it there, felt quite popular with my phone ringing all the time. "Hey Mel, do you want to catch up for breakfast?" "Hey Mel, where's Makati? Can I come shopping too?" "Do you have so-and-so's number?" "Whatcha doing for Lunch? Dinner?" So yeah because I had a lot planned unexpectedly I didn't get a lot of rest, and after a little cat nap this morning I'm still quite tired. Had to run around today getting off jobs done, like exchanging money, and buying dates for Dad (He loves them to bits.) Haven't even packed my suitcase yet! 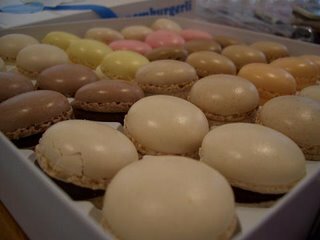 I'm also struggling to eat the Luxembrugli I bought when I flew to Zurich. Yes, after visiting Zurich, and stocking up on Max Brenner products in Manila, I have enough chocolate to open up my own store. Well, while putting out the garbage tonight, I came across a box that one of my neighbours had dumped on the floor of the chute. 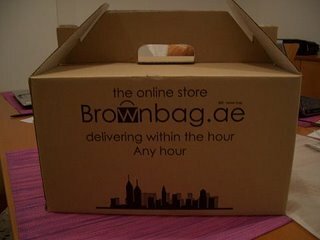 (nice work whoever that was :-/) The box was from Brownbag.ae, an online store unheard of in the UAE. I checked out the site, and it looked pretty funky. They guarrentee that they would deliver within the hour at any hour of the day or night. Very handy for all those late night piss-ups we seem to get every now and again, and they deliver anything from soft drink, to magazines, to rental videos, to chocolate, to phone cards, and condoms (But I think to most guys having to wait an hour for condoms is a bit of an effort). So I decided I had to try it out, to see if they really would dispatch it, and on time, and that I didn't have to give out my precious credit card to anyone. And whaddya know! It came! So cool! Hey guys, I know I haven't updated in a while. It's also as if I haven't had any excuse - when I'm not flying I pretty much sit at home on the computer anyway chatting to friends. Yesterday morning I came back from Glasgow, and there was one incident which put me in a crappy mood for the entire flight. It was after the meal service and these engineering guys from our airline were travelling back after their training or exams or whatever. The group of them were drinking hard liqour, and one of them wanted more ice for his Jack Daniels + Coke. "Wait a sec, I'll get some more ice tongs, the ones here have been put away"
"Oh no, that's alright, it's okay." After this, the guy STICKS HIS HAND IN THE ICE BUCKET! Disgusting! Other people have to use the ice! Haven't you heard of cross contamination? Of course we had to dump the ice, with 3 hours of the flight to go. A flight full of Scots who love their liquor. And Diet Coke. I could have smacked the guy. As some of you know, I'm not originally from Perth. I moved to Perth at the ripe old age of 7, having come from Newcastle in NSW. But the place I was born, and that is branded on my passport and birth certificate and al other document fodder for the rest of my life, is Werribee, Victoria. Thanks to my Dad, who was with the RAAF at the time, I no longer have to live there. To any Victorian, or even any clued up Aussie, Werribee is known for only a couple of things. It has a sewage plant. "Ah, you're poo farm girl!" So naturally, someone has made a blog of it now. It's only got a month's worth of photos/posts, but some of the pictures in there are definately worth a look. My favorite is the shopping trolly pyramid. Hey guys, hope all is well and good in Dubai. Yesterday I got really bored of staying at my apartment moping about, I actually called work and said I wanted to work on my day off. This month they gave me flights which didn't accumulate a lot of hours, and I hate days off anyway. So I called them up, and they said they didn't need crew! I couldn't believe it, especially on a Friday morning. Then they called me, and offered me four flights. London, Dusseldorf, Paris and Zurich. I won't say which one, but hopefully I'll catch a glimpse of Pierro and the Music Stars while I'm here. And hopefully I'll have some cool photos too. Well, it's breakfast time, and the further I can stay away from this computer the better. It's running on Windows 95 still and the keys are muddled about on the keyboard. 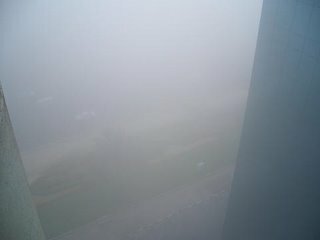 Woke up this morning eager for some Starbucks, and took a step outside and couldn't believe the amount of fog in the air. It's kinda hard to describe what it was like to walk outside, because it felt like it was raining on your skin, but the droplets are so fine that you didn't get wet. You could see the droplets move with the wind, so you know it wasn't smog. Very strange. Hello! I hope you're all doing well over in Oz, esp. those of you who are completing the final touches to their thesis/final assignment/lab/bribe for the lecturer. I know it's a little stressful but it's worth it in the end. From this end, I'm not doing anything constructive, just trying to get my hands and nails in tip-top shape. It doesn't require any heavy thinking on my part that's for sure. But the job...from the amount of soft drink cans we open up, the nails are ruined after every flight. So to get myself enthused, I went to Emirates Mall today. I had the biggest craving for a steak - and surely there are other places other than the Butchershop that offer steak on the menu. 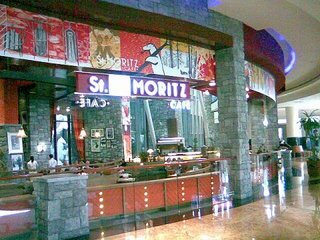 So I tried St Moritz cafe at Ski Dubai. 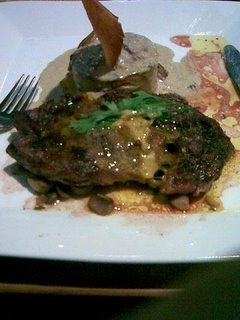 I took one look at the menu and immediately decided on the Char-Grilled Rib Eye steak served with sauteed mushrooms and Dauphined Potatos. When I first tucked in, I thought I'd finally found my Butchershop replacement. But alas, working my way through it, I realised how inferior it was. How much salt it had. How much better it could have been with some hot chips. And peppercorn sauce. And I then realised how good Aussie steak is. On a lot of Australian sectors I do, I've heard some of the crew get excited about the KFC in Australia, and how it's so much better than in Dubai, and how fresh it is, how it's made from chicken breast instead of the thigh, all of which is true of course. But then you tuck into a good steak, or a nice lamb salad, or fish and chips from Cicerello's, and wish that they weren't so sheltered.